Ukrainian Championship 2016/17. 17th round. December 4, 2016. Lviv. Arena Lviv. Att: 641. -3oC. Championship leaders Shakhtar were receiving the Premier League’s eighth side Stal in Lviv. Darijo Srna and Bernardrejoined the team after being suspended. Instead of Yaroslav Rakitskyy, Ivan Ordets appeared in central defence. In the absence of the injured Facundo Ferreyra, Eduardo spearheaded attacking moves. Before the opening whistle, the sides paid tribute to the players of Chapecoense, Brazil, who had died in a plane crash in Colombia, by observing a minute’s silence. Early in the first half, the Pitmen faced the opponents’ tight defence. As in the first leg, Stal dropped back, trying to impose their game in every section of the pitch. In this kind of game, Donetsk’s individual qualities were crucial. Bernard was particularly active early in the game. The Orange-and-Blacks’ number ten not only tried to create chances for his teammates, but also threatened the opposing goal. Halfway through the half, Eduardo found himself in the thick of events. On both occasions, he was shooting after a pass by Darijo Srna only to see his attempt go wide. On 23 minutes, Oleksandr Kucher joined the attack. But his volley after Bernard’s good slaloming run and precision pass did not reach the target. Marlos also tried to prove himself individually: on 30 minutes, the Brazilian was trying to beat three defenders, but was brought down in the visitors’ penalty area. He himself stepped up to convert the spot kick – 1-0. The first half ending saw some ding-dong action, with the teams leaving for the break with Donetsk winning narrowly. At half time Paulo Fonseca made the first substitution by fielding Taison instead of Bernard. The pace in the second half slowed down, although the Pitmen continued to spend most of their time near Stal’s box. The first clear-cut chance to double the number on the scoreboard came on 61 minutes. Oleksandr Kucher headed a Darijo Srna set-piece high ball, with the latter going just wide. Shortly after that, Andrii Boriachuk replaced Eduardo. Donetsk’s 20-year-old striker might well put his name on the scoresheet: he played one-two with Srna, but the volley turned inaccurate. 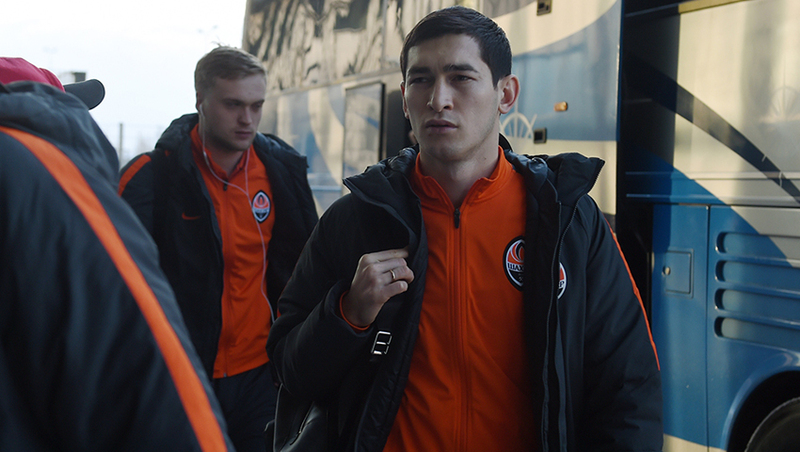 On 72 minutes, the mentor of Shakhtar fielded Dentinho instead of Viktor Kovalenko. The Orange-and-Blacks never ceased to attack and finally scored. On 79 minutes, Taison netted a spectacular goal. He hit the far corner from outside the penalty area to make it 2-0. 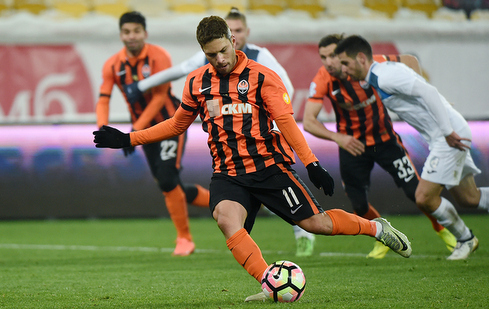 In the remaining time before the final whistle, Donetsk did not lose control of the game and easily claimed a well-deserved victory. The Pitmen will have their next match in Portugal on 8 December. In the Europa League group stage final round, Shakhtar are to encounter Braga away. The game kicks off at 18:00 EET.